We seem to have part of the answer as to what 23andMe will be doing in the short term. Tonight when I went to the 23andMe site, I was greeted with this message. 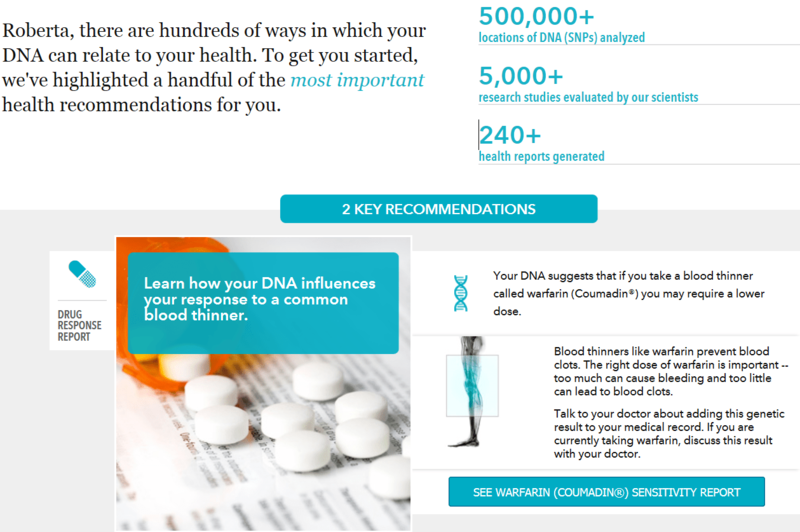 I clicked on “I Understand” and was then taken to the normal sign on screen where their test kit is marketed solely as a genetic genealogy kit, with all mention of health removed. After signing on, the health button on the main page is gone, but by clicking on “My Results” I can still see the Health Overview and proceed from there. They mentioned additional information on the Health page, but I did not see anything additional. Perhaps more is yet to come. I do notice that the Research Surveys, Health Profile, and Key Health Recommendations are still present and the health reports/interpretation portions are still there in my account. I was a customer prior to November 22, 2013. But still, I’m surprised that all of the health surveys and questions remain. They are clearly still data-gathering with their existing clients, so obviously hopeful about the FDA resolution. 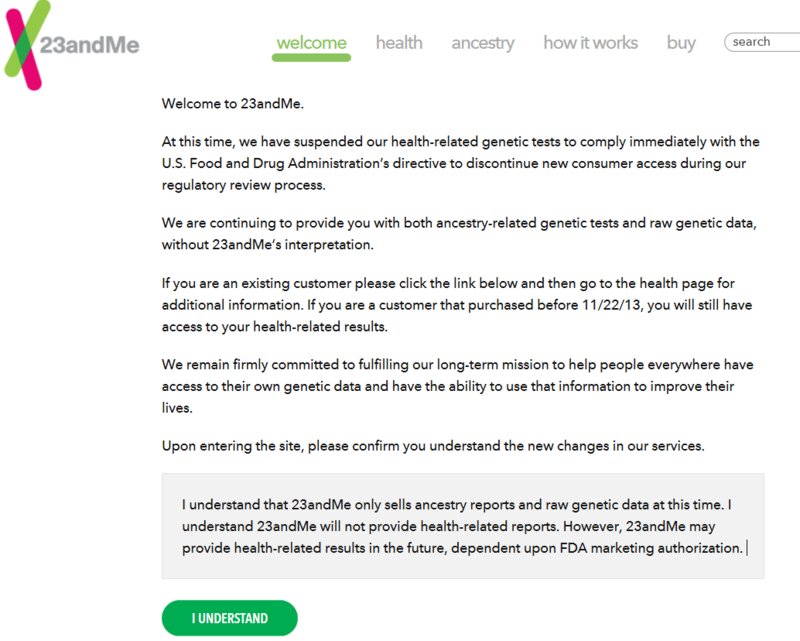 It appears that the genetic genealogy portion is “safe,” for now, although we don’t know what the future holds for 23andMe as they move through the regulatory process with the FDA. I also wonder if the genetic genealogy marketspace, which has never been a priority to them, can financially sustain them long enough to complete the FDA process. Part of that answer would likely rest upon how long the process takes and the depth of their pockets. So far, they are 5 years and counting, but we don’t know how far along they are in the process. Perhaps additional information will be forthcoming as the deadline of December 13, 15 or 16, depending on how you count, approaches. I would still suggest downloading your information, just in case, and I wouldn’t wait until the last minute. No matter how well intentioned they are, they may find themselves in a situation where they cannot provide extensive notification about impending changes. This entry was posted in 23andMe and tagged General Information by Roberta Estes. Bookmark the permalink. The health surveys are still up…. Sounds like a smart business move short term. In my wildest dreams this is a chance to take genetic genealogy mainstream – too many see it as a niche interest for little old ladies & retirees . I love how history & science come together & think it’s utterly compelling. School children are always fascinated when I tell them – who knows who you descend from? I have read up all about the American folk heroes like John Sevier – who knows about some of them if you are not American? Too many haven’t the faintest idea about how genetic genealogy works – a man today told me he always deletes messages from his ‘tailcoat matches’ ( as they are meaningless) meaning me. There are comments on the 23&Me blog currently re : the current problems & a good few say that the genealogy aspect of testing is useless for women as ‘you need a man to test’ to determine anything on the paternal side. You can’t find a father if you are female etc. These are intelligent commentators. You see this everywhere. Others at 23&Me are scared off by the ‘genome’ sharing aspect & assume I am party to private information I can use in a sinister fashion should I wish to do so. I am in the process of messaging all 1,000 matches & asking only for an ‘introduction’ most ignore. 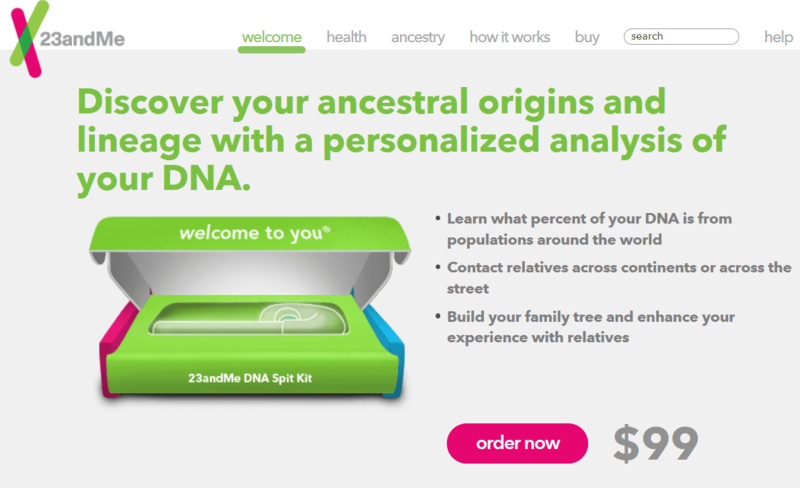 Maybe this might be a blessing in disguise for us genealogists that use 23andme, they may take the opportunity to focus on our needs to improve their site! * They’re not suspending the health TESTS. They will still be in the raw data. What they’re doing is suspending the health REPORTS. * My best guess is no, they can’t support themselves permanently with just genealogy/ancestry reports, and they don’t want to. You’re right, and I apologize for not reading the release more carefully. Thank you for continuing to cover this story. The cutoff date for the health test appears to be 11/23/2013. I purchased two kits on 11/25/2013 for my two grandsons primarily to check for a disease for which I am a carrier. Will 23andme be offering any refunds for situations such as mine? Yes, they said they will give full refunds and you will receive an e-mail about that. Can I get that info somewhere else with my raw data? What will the raw data tell me? Do you happen to know, if I got the test done from Ancestry.com and then submitted the raw data to SNPedia or similar sites, would the health results be comparable to those I’d get from submitting the raw data from 23andme (I live in a problematic state, unfortunately)? Do both sites evaluate enough of the same SNPs or does that differ too widely from company to company? I’m sorry to ask this so many months after the original post, but I wanted to put it in a relevant one.